Yes, I am even one of those that will put something I have already done on the list just so I can check it off! So last night I woke in the wee hours, and could not get my mind to shut off. And today is tapping day of course, and I have procrastinated, of course, so now I am up against it, of course. What’s new, that is the story of my life more or less! To shut my mind off, I make a list of what is on my mind; this took about an hour fifteen, then I was able to get back to sleep. See the image of my list below, or find the pdf, with clickable links, HERE. Now I need to power through the list, wish me luck! p.s. the “2016 Maple Syrup Lessons Learned” post is to be found HERE. p.p.s. Evernote is for list guys on steroids, go HERE if you are a list guy, or gal. John – you’re the best. Absolutely love the open dialogue about the challenges you face, the honest considerations and the matter-of-fact “here’s what I did about it” blog. Excellent stuff! Good to hear from you Dennis! And I hope all is well. Thank you for your kind words. For me learning that breakdowns lead to breakthroughs, failures to successes, has been a long time coming. Our year two is looking to be much more productive than year one, and for that I am thankful. I hope you will follow along and give us the benefit of your knowledge and experience, too. I have to say, I do not miss “the office,” but I have missed my friends and the daily exchanges. 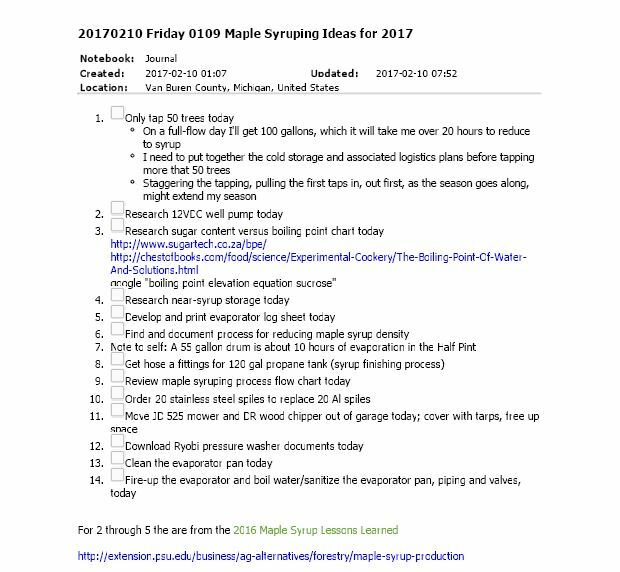 2017 Maple Syruping Season – GO!!! Maple Syruping Season – Starting, Ending, or Both?